When Sgt. Pepper’s Lonely Hearts Club Band came out in 1967, it was a revolutionary album that opened minds. And at the Alhambra, Bradford, Pepperland took a number of songs from that album, and through the medium of dance opened people’s minds even further. 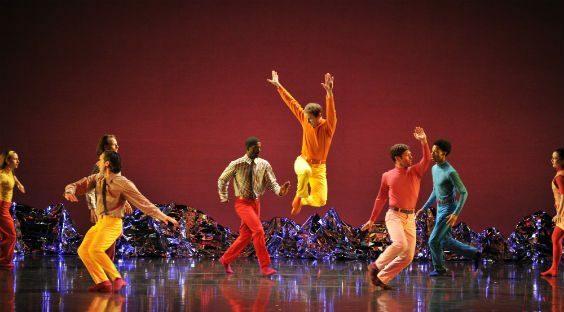 In what’s been dubbed as “A gorgeously entertaining and witty tribute…” the show opens like a neon rainbow. Each performer decked out in outrageous colours, as Sgt. Pepper accompanies the introduction of this vibrant show. 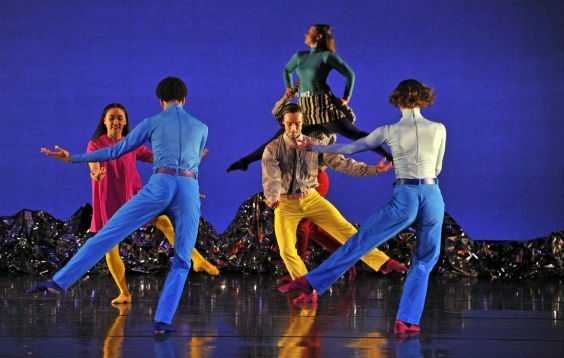 Mark Morris’ Dance Group had the challenge of performing seven Beatles songs, plus six pieces of Beatles musical moments that Ethan Iverson had fused in to something original. A jukebox musical kind of thing Pepperland is not. It isn’t a sing-a-long show, in fact its far from it. But for the passionate interpretive dance enthusiast, this show is a must. And the choreography was both profound and cheerfully quirky in equal measure. Walking, running, prancing. Mime is regularly brought in to proceedings, and a story was told within each and every delicate turn and pirouette. The Pepperland company performed ‘When I’m Sixty Four’, ‘Within You Without You’ and ‘With A Little Help From My Friends’ in a special and unique kind of way. Away from the stage, I was often transfixed on Rob Schwimmer in the band playing the theremin. Seeing him create the psychedelic sounds that accompanied the choreography was something else. An instrument I’ve always had a fascination with. But what pleased me the most about Pepperland was the inclusion of ‘Penny Lane’. Written for Sgt. Pepper and released as a single but not included in the final album. As far as Beatles songs go, it’s my favourite and if you needed a ‘commercial’ aspect to the whole performance, I think this was it. And I certainly admire the movement of the dancers, and their prowess and grace up on the stage was very impressive. A vocal free ‘A Day In The Life’ was beautifully played out at the end of the performance, just before ‘Sgt. Peppers Lonely Hearts Club Band’ ended the show. It was a strong ending to a production that the audience really enjoyed. For me, this kind of production doesn’t always excite and grab me as much as others, but I have a huge appreciation for the art-form, and the way a legendary album has been taken off the vinyl and placed on to the stage. It’s clever. It’s bright. And Pepperland is a very nice way to pay tribute to something so iconic and respected.